Micklegate Bar started off as a small gate into the city of York sometime between 1100 and 1132. In 1333, the defences of the gateway were beefed up, and a large barbican was built, and a portcullis was added, the additional height of the tower being added at this time to house the machinery required to raise and lower it. The slot down which the portcullis ran is still visible within the walls. Unfortunately for us, the barbican was removed in 1826 to aid the free flow of traffic into the city. The gatehouse was remodeled extensively in 1827, 1863 and during the 1950's, when the carved figures were erected on the two pepper pot turrets. Above. The external face of Micklegate Bar, minus its barbican. 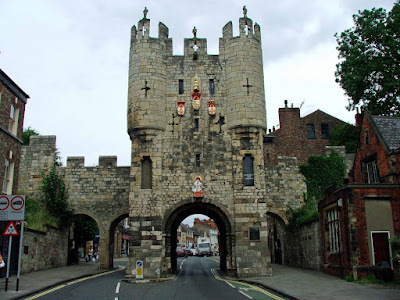 In 1569, the Earl of Westmorland commented that Micklegate Bar was the strongest bar, with the strongest portion of wall surrounding the city of York, and to this day, it has to be the most recognisable, and the most impressive of York's gates. It is first documented in records from the reign of Henry II, and some time around 1196, a grant was obtained for a house to be built above the gate. The gate was used, as well as a defensive structure, as a toll booth, with tolls on goods coming into the city being levied here. The barbican on the exterior of the gate, projected some fifty feet beyond the external walls. It was in an extremely poor state of repair by the early 1800's, with several drawings showing walls collapsed and even missing. When one of the side walls fell down in 1810, York Corporation decided that the while of the barbican should be dismantled, although it was not fully removed until 1826. There are four shields above the central arch of the gate: The shield directly above the arch, commemorates the restoration of the gate in 1737, and shows the arms of Lister Kaye. Above this shield, and to both left and right, are shields with the arms of the city of York. The top shield, with a gold helm over it, shows the Royal arms with 'France ancient'. Above. The internal face of Micklegate Bar. The passageways to either side of the gate are relatively modern additions. The double arched passageway, to the right of the above photo, dates from 1753, and was originally a single arch, designed by John Carr. The single arch was replaced by the two arches seen today, in 1863. The passageway to the left of the gate, was designed by Peter Atkinson, and built in 1827. The gate was the most important portal into the city of York, indeed, Royalty and other important dignitaries were all greeted by members of the City Corporation here. Henry VIII was famously greeted here when he visited York in 1486, when he was granted the keys to the city. James I was also greeted here in 1603, with trumpeters high on the city walls. Charles I was also greeted with great pomp some thirty years later, and when Queen Elizabeth II and Prince Philip visited in 1971, they too were greeted at Micklegate Bar. Following tradition, both the Queen and Prince Philip had to ask permission from the Lord Mayor of York to enter York. 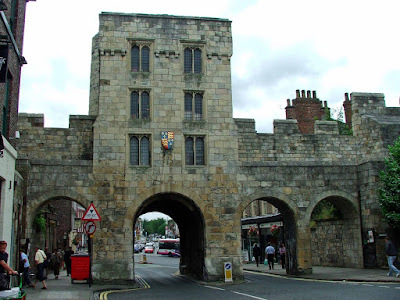 The gatehouse lays at the junction of Micklegate and Nunnery Lane, and is well worth a visit.